inhabited by Greek, Near Eastern, and Roman peoples. WHAT Edge of Empires: Pagans, Jews, and Christians at Roman Dura-Europos examines the life and culture of this ancient city (located in present-day eastern Syria), which flourished under the Romans from the mid-second to mid-third century CE. With 77 objects, the exhibition explores the diversity of and interconnections among religions, languages, and peoples that distinguished Dura-Europos. Strategically located on the Euphrates River, Dura Europos was founded in the fourth century BCE by Macedonian successors of Alexander the Great. However, it was under Parthian control from the late second-century BCE until 164 CE, when the Roman emperor Lucius Verus brought Syria, and thus also Dura Europos, under Roman control. The city then thrived as a military garrison until 256 CE, when it was destroyed by the Sasanian Persians. The cosmopolitan Roman town was exceptionally well preserved, with a wealth of artifacts that, upon their discovery, fundamentally altered our understanding of religious and military practice in the late Roman period. Highlights of the exhibition include numerous items that demonstrate the coexistence of multiple religions at Dura, with objects from its synagogue—the world’s best-preserved ancient synagogue; a Christian house-church that is older than any surviving church in Rome; and several pagan temples. Also central to Edge of Empires are objects that open a window onto imperial Roman military life and practice, including a spectacular shield and articles of dress that attest to the variety of cultures represented in the Roman military. Dishes, an engagement ring, and other quotidian items, many imported from across a broad swath of the ancient world, attest to Dura’s integration into the economy of the empire and tell us about the daily life of its inhabitants. SPONSORSHIP the McMullen Museum, Boston College. The ISAW presentation has been made possible through the support of the Leon Levy Foundation. PUBLICATION The exhibition will be supplemented by a 100-page publication containing essays by leading scholars, as well as a map of the region, a detailed site plan of Dura-Europos, archival excavation photos, a checklist of objects in the exhibition, and a selected bibliography. It will be available for purchase at ISAW and distributed by Princeton University Press. GUIDED TOURS Free guided tours of the exhibition will be offered on Fridays at 6 pm. FOR THE STUDY University was established in 2006 by the Leon Levy Foundation. WORLD larger scholarly community and the public with an ongoing program of exhibitions, lectures, and publications. Much more on Dura Europos here, including links to posts on other museum exhibitions. ARAMAIC WATCH: Targuman: SBL Aramaic Studies Session Finalized! Follow the link for details. NEW BOOK: MELEKHET MAHSHEVET: Studies in the Redaction and Development of Talmudic Literature. Edited By Aron Shemesh Aron Amit (Bar-Ilan University Press). This volume includes a selection of articles dealing with general questions regarding the redaction and the development of talmudic literature and with specific issues relating to different aspects of the editing and the transmission of certain talmudic works. The articles are based on papers delivered at an international conference sponsored by the Department of Talmud at Bar-Ilan University titled ``Rabbinic Textuality, Transmission, and Redaction: The Historical and Literary Processes which Generated the Rabbinic Corpus.`` These articles offer important innovations to contemporary research discourse and the volume as a whole is a major contribution to the study of Talmud and the history of the redaction of talmudic literature. The articles are in English and Hebrew. Follow the link for PDF files of the prefaces and TOCs. Well, maybe. On the one hand it is true that the only references to golden bells in the Hebrew Bible are to bells on the vestments of the high priest (Exodus 28:33-34; 39:25-26). On the other hand, first, the only other mention of bells (a different Hebrew word) refers to horses' trappings (Zechariah 14:20). Presumably, bells were used in many other contexts, so our sample of cultural allusions is limited. But, you say, what about golden bells? Well, second, Isaiah 3:16-18 refers to bangles that the rich women of Jerusalem wore on their ankles and which "tinkled" or made some king of bangle noise. These ladies clearly had lots of jewelery and finery (cf. also vv. 19-23), so it seems entirely likely that they sometimes wore bells as jewelry and that some of those bells might well have been made of gold. And we know that Second-Temple-era ladies in Jerusalem had very nice gold earrings. So this bell need not have come from "a man of high authority." It would be interesting to see what the Mishnah has to say about golden and other bells. In any case, I bet someone was extremely upset when this bell went missing. UPDATE (26 July): More here and here. Another review of "I Have Always Loved the Holy Tongue"
Two historians convincingly make the case that Renaissance scholar Isaac Casaubon, best known for expertise in Greek and Latin, was an industrious Hebraist. Isaac Casaubon (1559-1614), one of the greatest scholars of the late Renaissance, is hardly remembered today. In his time, though, this son of French Calvinist refugees living in Geneva was regarded by some as “the most learned man in Europe.” He held positions as professor of Hebrew in Geneva and Montpelier, was a librarian to the king of France, and ended his life in Oxford, England, as a personal friend of King James I and a friend by correspondence of all the leading members of the early 17th-century Republic of Letters. The authors admit that Casaubon was only a second-tier Hebraist. But his use of Hebrew illuminates the contribution of people like him not to philology per se, but to a revolution in theology and historiography. He was, they rightly point out, one of the first to realize the (currently self-evident) view that a better understanding of Second Temple Judaism, early Christianity and late Hellenism cannot be achieved without a thorough familiarity with, and respect for, all religious cultures and all languages of the period. Another review and additional background are noted here. A Professor of Semitic Studies from The University of Manchester is one of only 38 academics to be elected a Fellow of the British Academy at its Annual General Meeting on 21 July. John Healey is the latest scholar to add to the University’s leading international reputation in Middle Eastern Studies going back to the 1940s. John Healey came to the Manchester Department of Middle Eastern Studies from Durham University in 1989. He is a graduate of University College Dublin and obtained his PhD in 1977 at the School of Oriental and African Studies, University of London, for work on the Ugaritic literature — Ugarit was a Late Bronze Age city on the Syrian coast, destroyed c. 1200 BCE, but leaving behind a substantial poetic literature. Since the mid-1980s Professor Healey has concentrated on Aramaic inscriptions, especially in the Greek and Roman periods. He is currently working on a grammar of Nabataean Aramaic. Apart from being one of the editors of the University of Manchester’s prestigious Journal of Semitic Studies (Oxford University Press), he is on the editorial boards of Levant (London), Aram (Oxford) and Aramaic Studies (Leiden) and of journals published in Kuwait and Saudi Arabia. Earliest question mark found in Syriac? I’d describe it as a significant footnote in the history of writing." Questions are sometimes marked in Semitic languages by prefixed particles — in Hebrew and Arabic, for example. But this is a punctuation mark, not a word or particle. A salutary reminder of how much we still don't know about ancient languages. It dates back to ancient times and it embraces a lot of the archeological monuments and the Christian sanctities, the most important of which is the Convent of Sednaya Lady which is the second most important Christian sanctity after the Church of the Resurrection in occupied Jerusalem. Sednaya name was mentioned in the old registries and scripts which were found in the Convent where some of the archeological monuments were found dating back to the Classical Age such as the remains of a temple and Greek inscriptions as the royal orthodox scripts were written in the Syriac language in Sednaya till the 18th century. The City also includes the Cherubim Monastery which was built on one of the highest mounts at al-Qalamoun Mountain, and the name of the Monastery is an Aramaic word which means the angels. There is also a Monastery of Mar Thomas in Sednaya. I think the article means "sanctuaries," not "sanctities." “Greeks are Turks who think they are Italian,” the old joke goes. A matching phrase for this side of the Aegean could be “Turks are Mongolians who think they are Arabs.” Confusing? Maybe not. Ay did not give up his legal battle, appealing to the Constitutional Court to demand the article’s cancellation. They, too, ruled against the Syriac man’s appeal in order to maintain national unity through a ban on non-Turkish names. One may think the ban and its legal basis are ridiculous. In fact, the whole story, when seen from a wider angle, is even more ridiculous than the ban itself. GOOD NEWS: You can attend 'El Shaddai: Ascension of the Metatron' Comic-Con party. It's in San Diego too. I'm not into Comic-Con, but if I were in town I might try to use my Enochian credentials to crash this party. Leader of preservation campaign: I don’t think the argument is "real or not" – we know that this is a cemetery. After nearly a year, the Israel Lands Authority this month resumed work removing 500 fake tombstones from the Muslim Mamilla Cemetery in downtown Jerusalem, prompting furious condemnation from Muslim groups. The Islamic Movement accused the authorities of wantonly destroying graves, and appealed to the courts to impose a stop-work order on the removal. The order was rescinded in late June, said ILA spokeswoman Ortal Tzabar. Since then, authorities have removed an additional 100 fake gravestones. HT Joseph Lauer. Background here and here. Related here and links (regarding the Museum of Tolerance controversy). Leading archeologists call on Minister of Culture and Sport to keep politics out of Antiquities Authority. Four heads of university archaeological institutes have asked Culture Minister Limor Livnat to cancel the amendment she is sponsoring to the Antiquities Authority Law, which critics say aims to block left-leaning professionals from key positions in the authority. First, for North Americans: El Shaddai: Ascension Of The Metatron Delayed To August 16th. You'll just have to wait. But the European release is even later. El Shaddais Lucifel, In A Way, Is Game Designer Sawaki Takeyasu "When I thought of Lucifel, I had an idea of how I wanted him to look immediately," said Sawaki Takeyasu, lead designer on El Shaddai: Ascension of the Metatron. In the game you play as Enoch who is chosen to stop God from flooding the Earth since he has a pure heart. Lucifel, the suave character who asks Enoch if he has enough armor, guides him through his quest. Since Lucifel has a stronger personality than Enoch, I asked Takeyasu about his vision for the archangel. I suppose Lucifel sounds better than Michaer, as Retief would say. Background here and links. Cross-file under "Archangel Metatron Watch." Could Computer Analysis Help Date the Gospels? The discovery of the scrolls, Casey argued, essentially changed the game. Scholars now have the majority of words that they need extant in Aramaic from the right period to ‘reconstruct’ a large chunk of Mark’s Aramaic foundation. Back to Koppel and his team. Might their mode of computer analysis be able to shed more light on this? For example, comparing a carefully retro-translated Aramaic Mark with the larger sample of the Dead Sea Scrolls. What might such an analysis reveal? Would it suggest more than one author? Or might it falsify the whole proposition, in spite of Casey’s thesis? Assuming not, might it also help to more accurately date the composition of the source material? Enough, for example, for scholars to ascertain what decade the text was written. Casey argued in his book that Mark was written no later than 40 CE. Well within the decade of Jesus’ death and reported resurrection. Could Koppel’s or another group show it might have been even earlier? I have commented on Casey's retroversion attempts here. Bottom line: at best Casey has produced one of many possible retroversions of the Aramaic, but it is very unlikely that it consistently represents the Aramaic traditions that Mark had before him with any precision. Casey also often has to draw on later Aramaic and Syriac, when the relevant vocabulary does not survive in our very limited resources from the first century, and this adds yet another level of speculation to his reconstructions. Given these limitations to Casey's work, I am confident in answering that, no, application of the computer algorithm would not be able to help us detect multiple authors in the reconstructed Aramaic sources or to date them to within a decade or to falsify Casey's work. None of these things will happen unless, first, we recover a lot more actual Aramaic from the first century and, second, we develop retroversion techniques that are far more sophisticated than the ones Casey uses. I wouldn't count on either happening any time soon, if ever. UPDATE: Reader Jesse Abelman points me to a nonspecialist-friendly blog post about that computer algorithm at the Sephorim blog, written by one of the developers of the algorithm and the software, Professor Moshe Koppel: Attribution and Misattribution: On Computational Linguistics, Heresy and Journalism. Black and white images of the scroll with detailed textual analysis have been available online for a long time. Other PaleoJudaica posts on the Great Isaiah Scroll are here, here, here, here, and here. Douglas Goldstein: You used Game Theory to solve certain Talmudic problems in the Gemara and the Talmud. How does that work? Robert Aumann: I will tell you the story. There is a passage in the Talmud in Ketubot 93a, and it has generated a tremendous amount of ink over thousands of years, and really there was great difficulty in understanding it. My son was killed in Lebanon in 1982. I wrote him a letter once about a certain Talmudic issue and he wrote back Ketubot 93a and to look over there. I looked at this passage in the Talmud and I couldn’t figure it out. I, together with a colleague of mine, we looked at the numbers over there and they looked really, really odd. Then we decided to apply some game theoretic tools to try to understand this. Eventually we found one of those tools which really fit the number perfectly, but this didn’t satisfy us yet because it’s a sophisticated modern mathematical concept and it’s unlikely the sages of the Talmud knew about this. So we had to get to the bottom of the logic and this took us a few more months and finally we did arrive at it. The sages of the Talmud were very smart and sophisticated. Obviously, they didn’t know modern mathematics but they did know logic. It’s quite possible that the logic that we found behind these numbers really was in the minds of the Talmudic sages. It’s hard to believe, but they worked out a Game Theoretic approach. They did reach the conclusions, which were not at all obvious, so I take off my hat to them. More on Prof. Aumann's work on game theory and the Talmud is here. On a tangentially related note, Mario I. Blejer has a piece on The Talmud and Greek Debt in Project Syndicate. The Tourism Ministry, which has been working on the development of Ein Kerem for 20 years in cooperation with the residents, began in April 2010, on the basis of permits issued in 2005 and 2006, to build a large structure to house public bathrooms. A Jerusalem Municipality spokeswoman explained it as part of a larger project that would eventually include underground parking and other services for tourists. But during the work, builders found the remains of a water system dating from the Second Temple period. The discovery meant the ministry could not build a ramp to the bathrooms to make them handicap-accessible, as required by law, a spokeswoman for the Tourism Ministry said. In August 2010, the city’s legal adviser Yossi Havilio (who is distantly related to Ron Havilio) put a stop-work order on the building. At a meeting with the Antiquities Authority and neighborhood residents soon afterward, the decision was made to seal the building until another solution could be found. “The residents of Ein Kerem are telling the establishment that they’re making a mistake – we’ve been saying ‘Stop! This is a mistake!’ for the past 20 years,” said Ben Ofarim, the head of the local committee. This week, the Interior Ministry’s District Planning and Construction Committee is scheduled to release its opinion on the residents’ appeal regarding the building. The residents are asking for the building to be torn down, saying that the plan to renovate the area did not follow the proper building procedures for Ein Kerem, which include providing in-depth historical documentation before construction starts. No mention of Copper Scroll treasures in this article. BIBLIOBLOGOSPHERIC BOOK REVIEWS: Here are some recent book notes and reviews by blogging biblical etc. scholars. I've been tracking the location of a number of fragments of the scrolls in various collections, including those in the Green Collection. 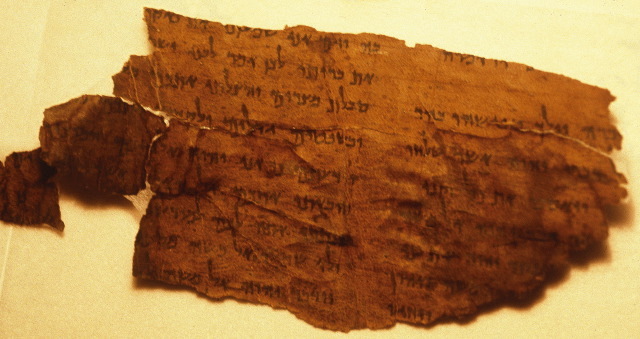 The one exhibited at OKC Museum of Art is a fragment of Gen.32:3-7 that previously was the property of the book dealer Michael Sharpe. There is a nice photograph on the Passages website, go to the newsroom and then within that to Green Collection Photo Gallery. See here. The photo of the scroll fragment is the third one down on the far left. Background on the exhibition is here. TODAY IS THE 17TH OF TAMMUZ. An easy fast to all those observing it. ZAHI HAWASS HAS BEEN FIRED: Egypt's Iconic Antiquities Chief Fired (AP). For now, at least. He has quite a reputation for comebacks. (HT Chuck Jones.) Background here, but then he was back for a while (cf. here). A new study of the photographic archives of one of the “big digs” of the 20th century reveals much more than artifacts and ancient architecture. It says something about a by-gone era in archaeology and the culture, psychology and practices of its participants. A recent study of the photographic archives of one of the 20th century's most sensational archaeological excavations and discoveries lends powerful credence to the phrase "a picture is worth a thousand words". Tucked away carefully within the archival collections of the Yale University Art Gallery in New Haven, Connecticut, more than 5,000 unpublished photographs taken between 1928 and 1937 recount a story in visual detail that cannot be fully told in the printed words of excavation reports, site journals or the popular press of the time. (HT James McGrath.) This article is based on an article by J.A. Baird in the current issue of the American Journal of Archaeology, which you can find online here and which is available through JSTOR. More on Dura Europos here and links. Copper Scroll treasures under a public toilet in Israel? COPPER SCROLL TREASURES buried under a public toilet in Israel? Neighborhood residents are convinced the bathroom-come-toolshed, which they call "the monster," was just a pretext for building an edifice that would some day serve as a restaurant. Have the Tourism Ministry and the Jerusalem municipality buried treasures from the Second Temple under a giant lavatory? That possibility is just one of the problems cited by opponents of a plan to improve a spring in the city's Ein Karem neighborhood, at one of Israel's most important Christian tourism sites. But perhaps worst of all was the handling of the site's archaeological relics. A salvage dig conducted by the Israel Antiquities Authority discovered ancient water systems that carried water from the spring to terraces on the wadi. This led the deputy mayor of Jerusalem, Naomi Tsur, to call a meeting in November 2009 to discuss how these relics could be preserved. The meeting, attended by Tourism Ministry and Antiquities Authority representatives, decided to freeze construction of the building and look into building an archaeological park there instead. But on the very day the meeting was held, the tourist corporation's vice president, David Mingelgreen, sent the municipality a letter saying that, for reasons unknown, all the archaeological findings had been buried under tons of earth the day before. Thus, by the time the meeting occurred, there was nothing left to salvage. From his letter, Mingelgreen appeared to view the findings as a nuisance. "The goal is to refrain as far as possible from work that will require archaeological digs," he wrote. There seem to be three issues here. First is the treatment of the site by the developers, and I leave those closer to the situation than I to evaluate the concerns. Second is the question of whether a treasure from the Copper Scroll could be at the site. This sort of thing is always possible, but establishing the location of any of the sites mentioned in the Copper Scroll is a maddeningly difficult challenge, so I'm pretty skeptical. It also seems doubtful that many, if any, of the caches of precious metals listed in the Scroll have been left undiscovered until the present. Richard Freund (of recent discovery-of-Atlantis-yet-again fame) thought he found one, but his case is not philologically compelling. Third, how did this "Palestinian treasure" (from the Copper Scroll?) come to be buried in someone's house in 1948? In short, I am doubtful about any connection with the Copper Scroll, but I hope the site is nevertheless being handled with appropriate archaeological care. I have a recent post on the Copper Scroll and other treasure hoards, real and imagined, here, with links as usual. An archaeological exhibit slated to open on Mount Scopus in 1948 finally kicked off last month with a display of tiles from the famed Dura Europos synagogue. Much more on Dura Europos here leading back to many links.